Kid Two = Jumping Out of an Airplane, AGAIN. I read a really great post recently about skydiving and parenting; the author truly hit the nail on the head in terms of relating your pregnancies (and impending children) to jumping out of an airplane. 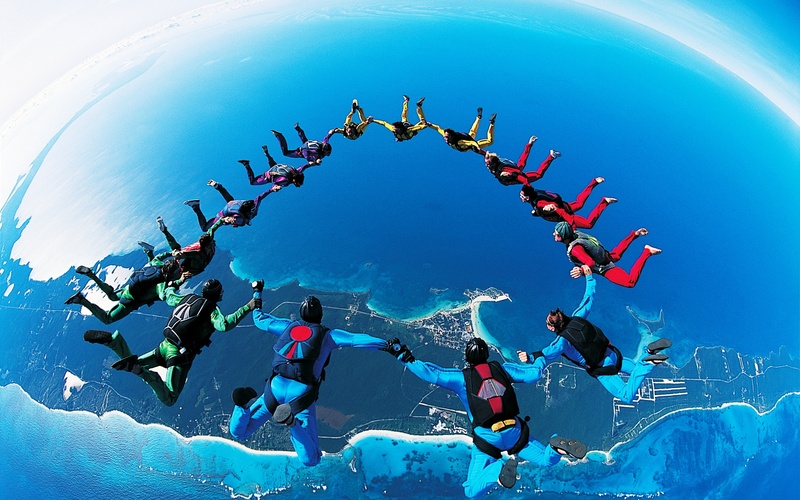 The first time you go skydiving, it’s thrilling and exciting. You think you know what to expect, but aren’t quite sure until you’ve jumped out of that plane, and taken flight (also, like with skydiving, THERE IS NO TURNING BACK WITH CHILDBIRTH). You had so much fun, you’re just crazy enough to decide to do it again, only this time it’s lost some of that sparkle. Because this time, you sort of know how it will feel and what to expect. Maybe this time you have a little more anxiety, because know that you understand how things are supposed to work, you worry about whether they actually will work the way you’ve anticipated. Having kids = Jumping out of an airplane. You see, with Kid One, you’re so superduper excited. You stare in wonder at your weekly fruit/vegetable update from The Bump (Poppy seed! Blueberry! Prickly pear! Jack-O-Lantern! Baby Orca!) You eagerly anticipate each week, moving further along in the club of expecting moms. You cannot WAIT to begin wearing maternity clothes! And you read an overwhelming volume of articles, books and blog posts on labor and delivery, because you have no clue what to expect, so you’d like to be prepared. You are glittering, sparkling ball of OMGBABY! You write your birth plan with stars and hearts in the margin of your notebook! And you are terrified; so afraid of birth, of what will happen, of what could go wrong, of how bad it could hurt, blah blah blah. Then IT HAPPENS, and the baby is HERE. You officially jumped out of the plane, and survived, and it was awesome and exhilarating and everything you’d hoped it would be and LET’S DO IT AGAIN! You also don’t know about the three week growth spurt, four month sleep regression, teething, various forms of poop, and being up every three hours for those first mind-numbing weeks (or months). You know, the “jumping out of a damn plane” part. But you know what? You figure it out. You pull the ripcord (or google “WHY IS MY BABY DOING THIS WEIRD THING? !”) and you become a full-fledged parent. Then, if you’re like us, once Kid One turns about a year old you decide…yes, really, LET’S DO IT AGAIN. You’ve officially joined the Parenting Circus (not the same as the Family Circus; PC has way more profanity and wine, trust). And now, with Kid Two, you probably aren’t as excited. What fruit am I this week? I don’t know, I feel like a watermelon but I don’t think that’s accurate until week 473. I started wearing maternity clothes before I even got pregnant again (because in reality, I never actually stopped wearing some of my favorite things from when I was pregnant with Kid One). I only want to advance in weeks because I would like this child to exit La Hacienda de Uterus. I have read zero articles on delivering Kid Two because I know how it works, and while I know some crazy situation could always arise, I also know that there are people more knowledgeable and trained than me who will handle figuring all that out. My birth plan is simple: BIRTH THE CHILD. Something else I’ve found with Kid Two that also happens when you jump out of a plane for the second time: This time, you know. Like, you know what’s going to happen, what it will feel like, what the end result will be. And that is what terrifies you this time. Because you know what the jumping out of the plane part is like; you know what pulling the ripcord is like. You know to be afraid of the witching hour, or cutting those first teeth. Maybe it’s a blessing that first timers don’t really know. And it’s a frightening blessing for us second timers in that we do know. But it’s more than just the care of a newborn; that part isn’t really that terrifying, because once you’ve parented a toddler, you can do anything in the entire world with one hand tied behind your back AND blindfolded while singing Wheels on the Bus for the 782nd time that day. The greatest anxiety I feel right now? It’s still in the knowing, but it’s not in the care, that much I know we can do…it’s in the emotion. Knowing how much you love Kid One, and wondering if it’s truly possible to love anyone as much as that. Knowing that your life is about to be turned upside down (again) while in a good way (again) but a very, very different way, because it’s not just Party of Three any longer, it’s Party of Four. How will Kid One handle the emotional process of gaining a sibling? Better yet, how will a toddler handle it? If you are unfamiliar with how well a toddler can handle a change in routine, try giving him the Big Bird sippy cup instead of the Elmo one. Go ahead, try it. I DARE YOU. When we had Miles, I regarded newborns with a healthy amount of fear and joy combined. It’s safe to say that those same feelings (is fearjoy a thing?) are still present and accounted for as we countdown to Kid Two. I have no doubt in my mind that we’ll make it. I mean, it’s not like we’re the first parents to have *gasp* two children. So we do the normal sibling-prep things. Miles talks to “his baby”, and kisses my belly (and will also remind me, “No, Mama, no baby”) We talk about BIG BOY things, the important job of being a BIG BROTHER, and how much fun this will be. We read books, sing songs, make crafts, things to incorporate the idea of becoming an older sibling. And we do a lot of extra extra snuggling. Is it enough? I don’t know; I’m sure we’ll still experience the ups and downs of change, just like we did the first time around. But we’ll handle it with grace and love and a fair amount of wine when necessary (and cookies…and chocolate…so much chocolate). kristin at hysterically ever after • This entry was posted in Mom Blog, preg blog and tagged kid two, preg stuff, skydiving. Bookmark the permalink. ← Naming Your Unborn Child: More challenging than naming your cat.